We ended 2015 with one of my younger sisters going into cardiac arrest twice on Dec. 29th. She was in the hospital one month - 1 week in ICU, 1 week in CCU and 2 weeks in the rehab ward. 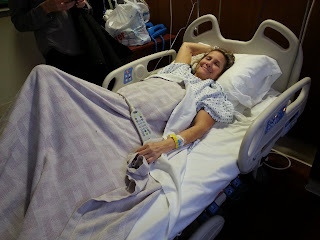 After coming out of the induced coma, our sister's memory was impaired and someone needed to be with her 24/7 in the hospital so family and friends took turns being there with her. Physically, she progressed well, but her memory (long term & short term) was not there. January was an especially trying month. I spent 13 days at the hospital with Paula and one day with her after she was released. In between this, I had to take mom to 2 doctor's appointments, the ER and for a cystoscopy; then I spent one whole day taking care of my parent's medical insurance paperwork. I had 6 doctor's appointments of my own. During this time, my brother's condition was rapidly deteriorating, especially since the family visits he was used to were drastically reduce as our focus was on our sister. On January 19, I drove my parents and our priest to see my brother. It was a good visit even though he had lost a lot of weight and hospice had to bring in a hospital bed for him. My car was not running properly most of the month, so I was never sure if I would make it to where I was going or back home, but there was no time to take it to the mechanic. Our brother hung on till they let Paula out of the hospital and family took her to see him. One of my sisters took me to see him on the 25th and it was obvious it would be a matter of days before he died. He passed away that Friday. My husband and I drove out to his house on Saturday to see if there was anything we could help his wife with. I am amazed at the quality of care my sister-in-law was able to give my brother while he was in hospice. I don't know how she was able to handle it even with all the help everyone tried to provide. She is such a loving, caring woman and my brother never truly appreciated her like he should have. We ended January with a celebration of our aunt's 95th birthday as we tried to process our brother's death two days before. February started with our brother's wake and a memorial luncheon several days later. 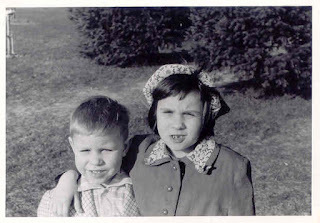 My brother's death hit me hard, but there was no time to grieve. Because our sister was on Medicaid, no outpatient rehab center that was qualified to handle her issues would take her. The hospital was kind enough to provide some follow up outpatient therapy for free but only for a few weeks. We were unable to leave Paula alone. She would freak out because she didn't know what had happened to her or why she was there (if she recognized her surroundings) or where she was (when she didn't recognize her surroundings). We ended up passing her around from one daughter or sister to another. Because we were family, most of the time, she refused to do what the therapists said she needed to do to regain her memory and she bristled every time we would try to help by reminding her that she needed to shower, brush her teeth, etc. It was not easy for any of us. Update for all - this is to explain why I have not been posting. These past 3 years have been a challenge to say the least. I have alluded to the fact that I have not been posting on my blog because of personal family reasons. I have not had the inclination to write even though I have several projects that I had started. The stress has taken a toll on me emotionally as well as physically. I come from a large family and we have been and still are very blessed. 2015 started with taking my mom to physical therapy 2x a week (after returning from one month in Nevada helping with my newborn grandson) in addition to all her other doctors’ appointments. Then one sister tore a muscle in her leg and subsequently had to deal with a blood clot. The youngest fell and broke her wrist as well as dislocating her shoulder and toward the end of the year was in the hospital with diverticulitis and an abscess for which she later had to have surgery. My older son continued to have problems with a work related injury after several surgeries to his elbow. My brother, who had been battling cancer for about 13 years at that point needed surgery again and was not doing well (in & out of hospitals). I flew to Nevada for a week for my grandson’s birthday. Upon my return, my brother was admitted to the hospital again and it didn’t look good. They discharged him into hospice care at home with 3 – 4 weeks to live, possibly up to 3 – 4 months and anything after that would be a miracle. My sister-in-law decided to care for him at their home about an hour and a half away. We all scrambled to make sure to spend some time with him. I took my parents and a priest (a family friend that my brother & I knew well) to visit. I called my son in Nevada and he flew in with his whole family. He said he would rather see him while he was still with us then fly in for the funeral. With all the family and friends visiting him, our one and only brother rallied. Our sister, Paula, came in from Michigan about once a month for 4 – 7 days to help with his care. Another sister and her husband would come in from Michigan and help at the house one weekend per month. Family from the Czech Republic flew in and spent time with him in November. His friends from out of town all made an effort to stop by to visit him several times. It was especially hard on our elderly parents as they tried to prepare for the death of their only son. I, as the oldest of 8, was the one everyone turned to the most for emotional support even though they all tried to support his wife and be there for each other as well. I was busy with taking my parents to doctor’s appointments and going to my own and I was unable to go see my little brother as much as I would have wanted to. When I saw him in September, he had lost a lot of weight and I didn't think he would make it to Thanksgiving. Someone let him know that I had expressed this thought which prompted him to call me and tell me that not only would he be with us at Thanksgiving, but also through the New Year. Knowing him the way I do, I knew I could take his word as gospel. With his wife's care, all our attention and many many prayers, he was here with us for a total of nine months - truly a miracle. My brother and I were very close growing up. We were a year and a half apart and we did most things together. We fought a lot but we were very protective of each other. In other words, we could beat on each other but don't anyone else dare touch either of us. We shared a lot of good and bad times. We did have some friends and independent interests so we weren't joined at the hip. As we grew into our teens, we gravitated more to doing things on our own with our own friends. For example, I really didn't want my younger brother tagging along on my dates. Though I did have to take him with me a few times at my parents' insistence. Our relationship changed over the years and we didn't see each other as often, but we continued to have a strong bond till the end. Writing was not at the top of my list that year so I only posted a few times.